Post-ventriculoperitoneal (VP) shunt placement intracerebral hemorrhage is a rare complication and carries a high mortality. In the present article, we describe a case of a 22-year-old male who underwent VP shunt placement and developed massive intracerebral hemorrhage with intraventricular extension and review the relevant literature to understand the underlying causative pathophysiology. Ventriculoperitoneal (VP) shunt is a relatively safe, commonly performed neurosurgical procedure for the management of hydrocephalus due to various etiologies., However, this relatively simple procedure can be associated with many complications.,,,, In rare circumstances, VP shunt placement can be associated with life-threatening intracerebral hemorrhage along the stunt tract.,,,,,,,, In the present article, we describe a case of VP shunt where the patient developed massive intracerebral hemorrhage with intraventricular extension and review the relevant literature to understand the underlying causative pathophysiology. A 22-year-old male patient who sustained traumatic brain injury 3 months back was diagnosed to have traumatic subarachnoid hemorrhage due to traumatic intracranial aneurysm which was clipped. Following surgery, he was granularly making a good recovery. Now, he presented with headache, vomiting, and swaying while walking. There was no history of fever or seizures. On examination, he was conscious, had slurring of speech, and was obeying commands. His general and systemic examination was normal. Cranial nerve examination was normal, except fundus which showed bilateral papilledema. His blood investigations including platelets and coagulation profile were normal. Computed tomography (CT) scan brain plain showed significant dilatation lateral, third, and fourth ventricles, suggestive of hydrocephalus. The patient underwent right VP shunt. Cerebrospinal fluid (CSF) was under high pressure and clear. He recovered well after surgery. CSF examination was normal. On the 3rd day after surgery, the patient had multiple episodes of generalized tonic–clonic seizures and lapsed into altered sensorium. He had difficulty in breathing and was immediately intubated and electively ventilated. 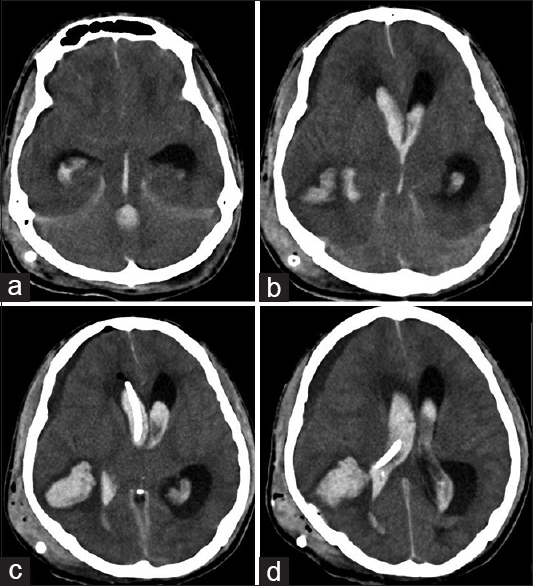 A repeat CT scan showed massive intracerebral hemorrhage along the shunt tube tract with intraventricular extension [Figure 1]a, [Figure 1]b, [Figure 1]c, [Figure 1]d. An external ventricular was placed and blood-stained CSF was drained. Repeat blood investigation showed platelet count of 257,000/mm3. Prothrombin time was 24.1 s (control – 13.6 s), INR was 1.83 (normal – <2.0), and APTT was 62.9 s (control – 28.8 s). There was evidence of bleeding from anywhere. The patient did not recover and was expired 4th day postsurgery. Post-VP shunt intracerebral hemorrhage is a rare complication, and the incidence ranges from 0.3% to 4% in published literature.,,,,, However, it is difficult to estimate the true incidence of post-VP shunt intracerebral hemorrhage as in most the patients, the lesions are very small. In the majority of the patients, the post-VP shunt intracerebral hemorrhage occurs soon after the shunt placement and most of the hemorrhages are located along the shunt catheter tract, and the hemorrhages may or may not extend into the ventricular system., The exact mechanism responsible for post-VP shunt intracerebral hemorrhage is not known, and various explanations have been proposed. The possible mechanisms include preexistent coagulation disorder, disseminated intravascular coagulation, anticoagulant treatment, direct injury to the cerebral vessels during catheter insertion, erosion of the vessels by the shunt catheter, fragile brain tissue due to cerebral edema, atherosclerosis, moyamoya disease, vascular malformations, injury to the choroid plexus, and traumatic brain injury.,,,,,,,,, It has been suggested that injury the brain choroid plexus can result in release of tissue thromboplastin which can induce disseminated intravascular coagulation and hemorrhages in previously fragile brain (due to trauma as in present case). Post-VP shunt placement intracerebral hemorrhage is a rare complication and carries a high mortality., The management of the patients with intracerebral hemorrhage after VP shunt placement depends on the size of the lesions. Smaller lesion does not need surgical intervention; however, the large, life-threatening lesions will require surgical intervention. Wu Y, Green NL, Wrensch MR, Zhao S, Gupta N. Ventriculoperitoneal shunt complications in California: 1990 to 2000. Neurosurgery 2007;61:557-62. Zhao J, Chen Y, Yang K, Hu X. A case of repeated intracerebral hemorrhages secondary to ventriculoperitoneal shunt. Interdiscipl Neurosurg 2015;2:48-50. Agarwal A, Kakani A. Shunt malfunction due to proximal migration and subcutaneous coiling of a peritoneal catheter. J Neurosci Rural Pract 2010;1:120-1. Agrawal A, Rao G. Subcutaneous shunt catheter calcification: An uncommon cause of shunt failure. Saudi J Med Med Sci 2014;2:125. Gupta M, Digra NC, Sharma N, Goyal S, Agrawal A. Migration of the peritoneal catheter of a ventriculoperitoneal shunt into the scrotum. S Afr J Child Health 2012;6:93-4. Savitz MH, Bobroff LM. Low incidence of delayed intracerebral hemorrhage secondary to ventriculoperitoneal shunt insertion. J Neurosurg 1999;91:32-4. Sengul G. Coexistence of subdural and intracerebral hematoma in a shunted infant not related to ventricular catheter. Neurosciences (Riyadh) 2008;13:308-9. Bavbek M, Göksel M. Multiple delayed intracerebral hematoma after ventriculoperitoneal shunting. Turk Norosirurji Derg (in Turkish) 1997;7:82-4. Matsumura A, Shinohara A, Munekata K, Maki Y. Delayed intracerebral hemorrhage after ventriculoperitoneal shunt. Surg Neurol 1985;24:503-6. Ma L, Chen YL, Yang SX, Wang YR. Delayed intracerebral hemorrhage secondary to ventriculoperitoneal shunt: A case report and literature review. Medicine (Baltimore) 2015;94:e2029. Ivan LP, Choo SH, Ventureyra EC. Complications of ventriculoatrial and ventriculoperitoneal shunts in a new children's hospital. Can J Surg 1980;23:566-8. Palmieri A, Pasquini U, Menichelli F, Salvolini U. Cerebral damage following ventricular shunt for infantile hydrocephalus evaluated by computed tomography. Neuroradiology 1981;21:33-5. Snow RB, Zimmerman RD, Devinsky O. Delayed intracerebral hemorrhage after ventriculoperitoneal shunting. Neurosurgery 1986;19:305-7. Fukamachi A, Koizumi H, Nukui H. Postoperative intracerebral hemorrhages: A survey of computed tomographic findings after 1074 intracranial operations. Surg Neurol 1985;23:575-80. Zhou F, Liu Q, Ying G, Zhu X. Delayed intracerebral hemorrhage secondary to ventriculoperitoneal shunt: Two case reports and a literature review. Int J Med Sci 2012;9:65-7. Kubokura T, Nishimura T, Koyama S, Sanno N, Tsubone K. Delayed intracerebral hemorrhage following VP shunt operation. No Shinkei Geka 1988;16(5 Suppl):523-7. Mascalchi M. Delayed intracerebral hemorrhage after CSF shunt for communicating “normal-pressure” hydrocephalus. Case report. Ital J Neurol Sci 1991;12:109-12. Woollam DH, Millen JW. Vascular tissue in the central nervous system. Pathol Central Nerv Syst 1968;1:486-98. Alcázar L, Alfaro R, Tamarit M, Gómez-Angulo JC, Ortega JM, Aragonés P, et al. Delayed intracerebral hemorrhage after ventriculoperitoneal shunt insertion. Case report and literature review. Neurocirugia (Astur) 2007;18:128-33. Misaki K, Uchiyama N, Hayashi Y, Hamada J. Intracerebral hemorrhage secondary to ventriculoperitoneal shunt insertion – Four case reports. Neurol Med Chir (Tokyo) 2010;50:76-9. Koktekir E, Tatarli N, Ceylan D, Karabagli H, Akdemir G. An unusual mechanism of delayed intracerebral hemorrhage after ventriculoperitoneal shunting: Case report. NÃ Rolojik Bilimler Derg 2012;1:398-401.